Jones emphasized the importance of diversity outreach within the Republican Party. 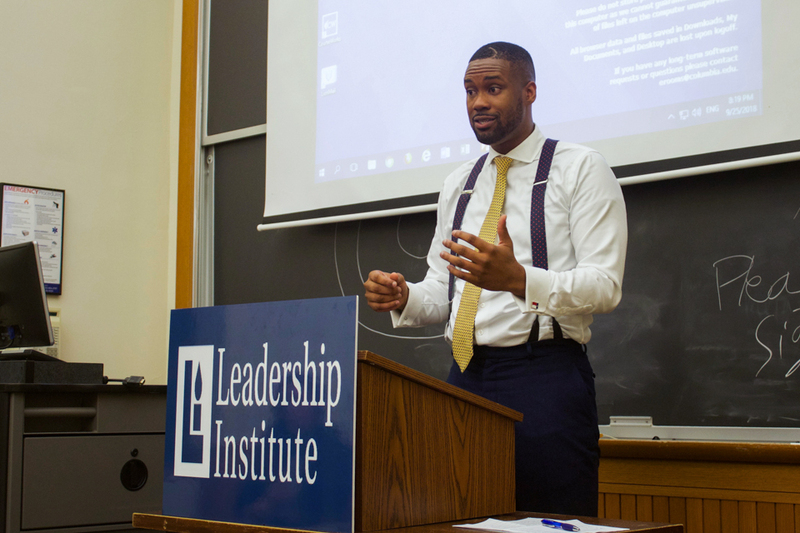 Conservative radio host and author Lawrence B. Jones emphasized the importance of diversity outreach within the Republican Party at the Columbia University College Republicans’ first event of the year on Tuesday. Jones’ speech, which was attended by a predominantly white audience of about 35 people, marked a sharp contrast to last year’s CUCR speaker series, which featured alt-right figures and white nationalists including Mike Cernovich and Tommy Robinson, both of who presented arguments against diversity as envisioned by liberals. Jones is the editor-in-chief of conservative news site Campus Reform, whose mission is to report on incidents of ostensible liberal bias on college campuses. Jones, who campaigned for Obama, said he turned to the Republican Party after feeling that the Democratic Party had not delivered on its promises to black voters. Jones argued that the progressive movement has failed to deliver on diversity policies meant to help minority communities, explicitly referencing the unaddressed needs of those within the black community. He said that despite the actions of the Democratic Party, Republicans should also be doing more to reach out to black communities, specifically calling on conservative students to appeal to black voters. Jones said that this kind of outreach will determine the Republican Party’s future trajectory. Jones also criticized the left’s selective outrage in response to issues that affect marginalized communities. One student asked Jones how to engage with students who were offended by a social media post she made defending Supreme Court nominee Brett Kavanaugh, who was accused of sexual assault by two women this week. Jones said that today’s politically correct environment has made it difficult for people to engage with opinions that they do not agree with. “The whole ‘hurt feelings movement’ has destroyed our generation,” he said.